Language and creativity are powerful tools for emotional transformation. This healing story series honours the human journey from hurt to creative self-empowerment, limitation to inspired new possibilities, and fear to compassionate contribution. Telling your truth, and sharing how you have creatively healed through life's challenges inspires us all to move from pain to empowerment. 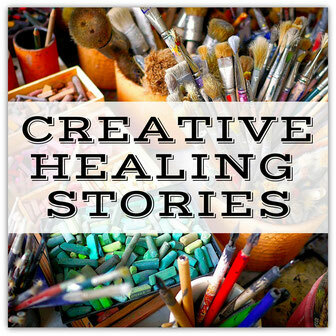 If you feel inspired to share your creative healing story please contact me at shelley@expressiveartworkshops.com and take a look at the 14 questions to guide your essay. Each person who shares their healing journey holds a forever place in my heart. I welcome you to enjoy these healing stories and connect to the creative work of the story writers below. And, I welcome hearing your story and promoting your personal web page via Pinterest and my FB Page. Mabel Valdiviezo - Filmmaker - Empowering women and immigrants through film, story, and art journaling. Julianna - Digital Artist - Healing the emotional roots of self-harm and self-medication with creative self-expression. Eleanor - Art Therapist and Mother - An art therapist's metaphorical letter of healing to her three daughters. Jill - Mixed Media Artist - Overcoming anxiety and panic attacks by processing repressed memories of childhood sexual abuse. Marguerite Bryant - Artist and Writer - Finding self-love and self-reliance through art journaling. Albin Talik - Paper Painter - Overcoming the pain of a neglected childhood and finding peace and joy through colorful paper painting. Jackie Schuld - Encouraging others through grief and loss through the joy of illustration. Nancy Calef - Painter, Author, Singer-Songwriter - Recovering from anorexia and bulimia through multi-disciplined creative expression. Heidi Easley - Painter - Overcoming bankruptcy with resourcefulness and creativity. Angela Rooker - Author, Poet, Artist - Surviving childhood sexual abuse through expressive art and writing. Lynn Newman - Intuitive Painter - Reclaiming inner power through the creative process of intuitive painting. Prema Malhotra - Abstract Expressive Artist - Surviving and healing sexual assault with abstract self-expression. Pam Waller - Healing Heart Artist - Healing the inner child in middle life, and a thousand sketches later, turning to the joy of collage and photography. Phyllis A. Taylor - Painter - Transforming emotional pain into purpose at age 70. Eva D. - Painter - The journey from a psychiatric hospital to teaching people how to paint online. Louise Chalmers - Creative nature therapy. María Sanz Gallego - Gestalt Art Therapist in Madrid. Morgan Blair - Healing an eating disorder through art.